This is installment 4. Part 1 is HERE; Part 2 is HERE, Part 3 is HERE. Studies (Here, Here, Here) have shown that a Paleo-type diet embraces those nutrients that allow our individual cells to survive and thrive, and has been the way of eating through the course of human evolution. I will go into a full description of this way of eating in a future installment, but first I will discuss the connections and underlying causes of chronic inflammation and chronic disease? Here is the connection – the vicious cycle. What goes into our mouths affects our good bacteria and our overall health. Our gut bacteria are the major players in health and disease. 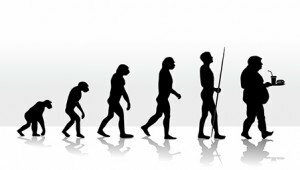 Our guts never evolved to deal with acellular carbohydrates effectively. These acellular carbohydrates changed the gut bacteria (known as the gut microbiome) and increased the harmful types of microbes. Harmful bacteria and lipopolysaccharides (LPS), which are cell membrane remnants of dead gram-negative bacteria, began to proliferate in the gut causing irritation and imbalance of bacteria. This is an unhealthy development. I have created this diagram to help you visualize the damaging part of gram-negative bacteria. My diagram is a make-believe bacterium, half of which represents a gram-positive bacterium and the other half represents a gram-negative bacterium. The left half is the gram-positive part and the right half is the gram-negative part. 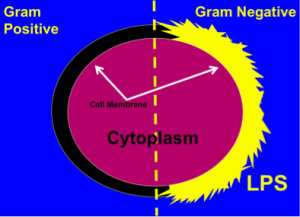 The cytoplasm (the liquid center of the cell) is noted in the center and the cell membrane is identified with white arrows. The most distinguishing feature telling the two bacteria apart is the outer layer of their cell membranes. The outer layer of the cell membrane of the gram-positive bacterium is relatively smooth; the outer layer of the cell membrane of the gram-negative bacterium is extremely jagged. This rough layer is known as the Lipopolysaccharide outer shell, and it only occurs on gram-negative types. After gram-negative bacteria die, the LPS remnants can act like spurs. They become serious problems if they get into the bloodstream. An accumulation of unhealthy bacteria in our gut is not the only problem. Ingested toxins also can irritate the intestinal lining. In addition, our digestive system never evolved to completely breakdown the proteins in grains. In the next installment I will describe how LPS, toxins, and undigested proteins get into the bloodstream to cause havoc.